The SR3000 V2 is a Stationary Reader for ISO 11784/11785 transponders with exceptionally good RFID performance. It comes with a range of panel antennas and can read and control two inputs and outputs. It is fit for single and multiple reader configuration and is designed for easy integration by OEM’s and System Integrators. The SR 3000 V2 replaces the powerful SR 3000 (V1). 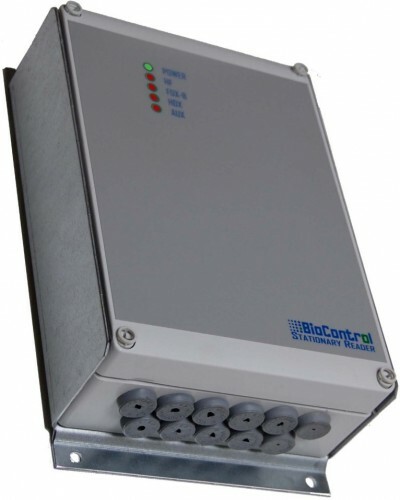 Just like the V1, the V2 is equipped with standardized computer interface to suit both RS232 interface with a PC or other serial device, as well as addressable interface on a RS485 field bus. The 2 inputs are equipped with pull-up resistors and can be used e.g. for detecting a gate switch or photo cell. The 2 solid state outputs can be used e.g. to operate relays or actuators. A simple communication protocol sets and reads the I/O’s and can also switch on/off the HF-field. The integrated auto-tuning warrants optimum identification in dynamic environments, even when the antenna environment changes due to (unexpected) external circumstances. The DSP-algorithm is fine-tuned for optimum RFID performance with both FDX-B and HDX transponders. The DSP-software can be (re)loaded from a PC to embed latest RFID and noise cancellation algorithms. Dimensions 25.0 x 17.5 x 7.5 cm. * Use PS SR3000 for verifiable RFID performance!